To embody self-regulation means you are in your own power, and you are creating the life you want while you pursue your goals. Regulation of self through embodied practices (e.g., yoga and mindful practices). An effective tool in the prevention and treatment of psychosocial disorders. My research focuses on the exploration and validation of the Attunement Model of Wellness and Embodied Self-Regulation. 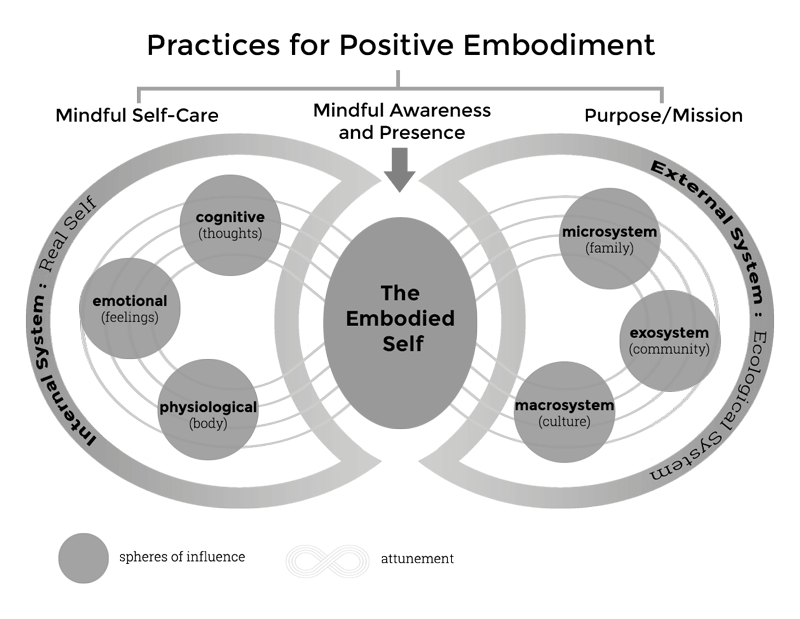 This interactive model is composed of two systems: the Internal System and the External System. Healthy, embodied self-regulation occurs when an individual is able to maintain an awareness and maintenance of the needs of the inner aspects of self (i.e., physiological, emotional, and cognitive), while engaging effectively within the context of family, community, and culture. The self system is an internal system experienced by the individual as his or her Real Self. The external system is modeled after Bronfenbrenner’s ecological model (1979). Attunement is the process by which the Internal and External Systems are interconnected. 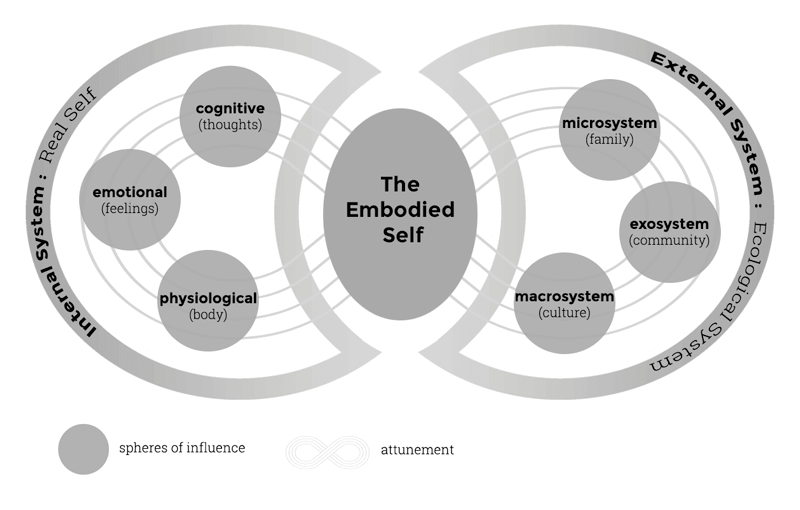 The Embodied Self is the constructed self that is presented to the external system. The two systems are interconnected by a process: attunement. Based on Daniel Siegel’s theoretical work, attunement is defined as a reciprocal process of mutual influence and co-regulation (Siegel, 1999, 2007). Attunement of the internal system and external system is facilitated by the Representational Self. The Representational Self (or the Embodied Self) is the active construction of self. It is the embodiment of the ongoing behavioral patterns — how they engage with their environment— that creates and maintains attunement within an individual’s inner and outer lives (Cook-Cottone, 2006; Cook-Cottone, 2015a, 2015b). In the absence of skills, knowledge, and resources necessary to maintain attunement and connection with the Authentic Self (e.g., healthy boundaries, supportive relationships, and an ability to discern the wellness promoting and risk enhancing aspects of community and culture), there is risk for dysfunction and disorder. 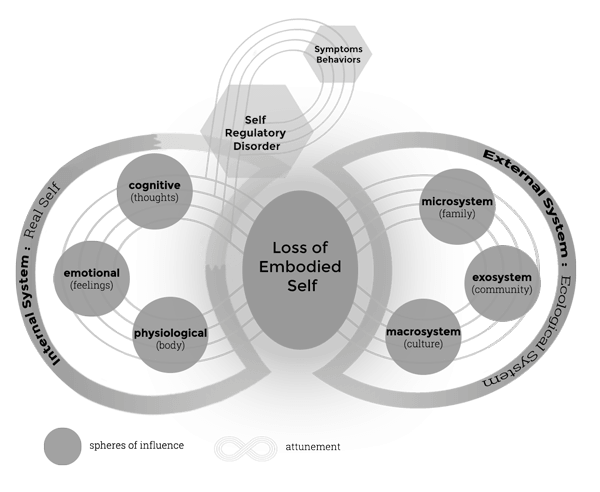 Influences from the internal system and/or external system may collectively or cumulatively result in loss of the embodied self (or development of the Disordered Representational Self). The Attunement Model of Wellness and Embodied Self-Regulation can thus help researchers and practitioners understand a variety of adaptive and maladaptive symptoms and behaviors, such as trauma, eating disorders, addictions, and self-mutilation. The practice of mindful self-care is seen as the foundation required for physical and emotional well-being (Cook-Cottone 2015a; Linehan 1993; Linehan 2015). Furthermore, a growing body of research suggests that practices such as yoga, mindfulness, and meditation, which promote mindful awareness and presence, may enhance positive embodiment and well-being. Finally, research also aligns meaning and purpose with happiness and well-being. Cook-Cottone, C. P. (2006). The attuned representation model for the primary prevention of eating disorders: An overview for school psychologists. Psychology In The Schools, 43(2), 223-230. Cook-Cottone, C. P. (2015). Mindfulness and yoga for self-regulation: A primer for mental health professionals. New York, NY York: Springer. Cook-Cottone, C. P., (2017). Mindfulness and yoga in schools for teachers and practitioners. New York, NY: Springer.